(from Wikipedia, the free encyclopedia) The MGB is a sports car launched by MG Cars in May 1962 to replace the MGA and manufactured until 22 October 1980—originally by the British Motor Corporation and later by its successors. MGB production continued throughout restructuring of the British motor industry, and the parent company’s transition from BMC to British Motor Holdings (in 1966) and to British Leyland Motor Corporation (in 1968). Originally introduced as a convertible ("roadster"), a coupé (the hatchbacked "GT", almost a shooting brake) version, with 2+2 seating, was introduced in 1965. The MGB featured a four-cylinder petrol engine. A derivative model, called the "MGC" featured a six-cylinder engine and a later variant, called the "MGB GT V8" fitted with the ex-Buick Rover V8 engine was made from 1973 to 1976. Combined production volume of MGB, MGC and MGB GT V8 models was 523,836 cars. A very limited-production "revival" model with only 2,000 units made, called "RV8" was produced by Rover in the 1990s. Despite the similarity in appearance to the roadster, the RV8 had less than 5% parts interchangeability with the original car. 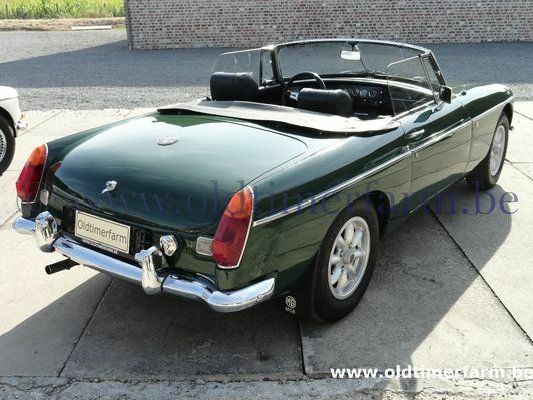 The MGB was a relatively modern design at the time of its introduction. It utilized a monocoque structure that reduced both weight and manufacturing costs as well as adding chassis strength. This was a considerable improvement in comparison to that of the traditional body-on-frame construction used on the earlier MGA and T-type models as well as the MGB's rival, the Triumph TR series. The design included wind-up windows and a comfortable driver's compartment, with plenty of legroom and a parcel shelf behind the seats. The MGB's performance was brisk for the period, with a 0–60 mph (96 km/h) time of just over 11 seconds, aided by the relatively light weight of the car. Handling was one of the MGB's strong points. The 3-bearing 1798 cc B-Series engine produced 95 hp (71 kW) at 5,400 rpm. The engine was upgraded in October 1964 to a five-bearing crankshaft in an effort to improve reliability. A majority of MGBs were exported to United States. In 1974, as US air pollution emission standards became more rigorous, US-market MGBs were de-tuned for compliance. 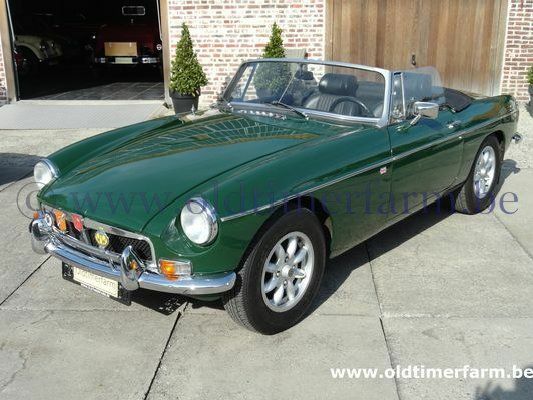 As well as a marked reduction in performance, the MGB gained an inch in ride height and the distinctive rubber bumpers which came to replace the chrome for all markets. The MGB was one of the first cars to feature controlled crumple zones designed to protect the driver and passenger in a 30 mph (48 km/h) impact with an immovable barrier (200 ton).